As we creep ever closer to DragonCon, we're celebrating National Badge Ribbon Day. (And yes, we'll have our ridiculous Flopcast badge ribbons at DragonCon, available for the very reasonable price of one human soul.) We also take another trip into the Pudding Pages, and learn of a shocking pudding-themed incident in Kornflake's past. And then, of course, we look at High Feather episode 9, featuring chocolate-covered tennis players, jelly sandwiches, and a little dog named Scruffy. Just one more High Feather episode to go, kids! Then we can all get on with our lives. 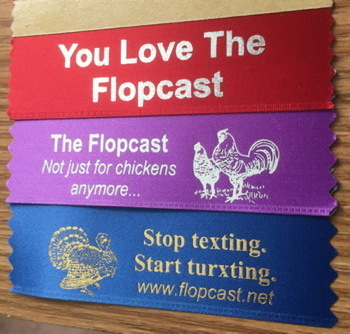 Badge ribbons are a staple at many cons, and we enjoy giving away Flopcast ribbons whenever we can. 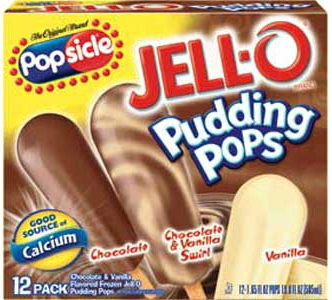 Kornflake and the Mayor both had a fondness for the chocolate & vanilla swirl variety of Jello Pudding Pops.